Alfred was born in 1890 in Norwich, Norfolk, the son of Frank Pomeroy, a manager, and Annie (nee Crozier). In the 1911 census Alfred is listed as a cook. 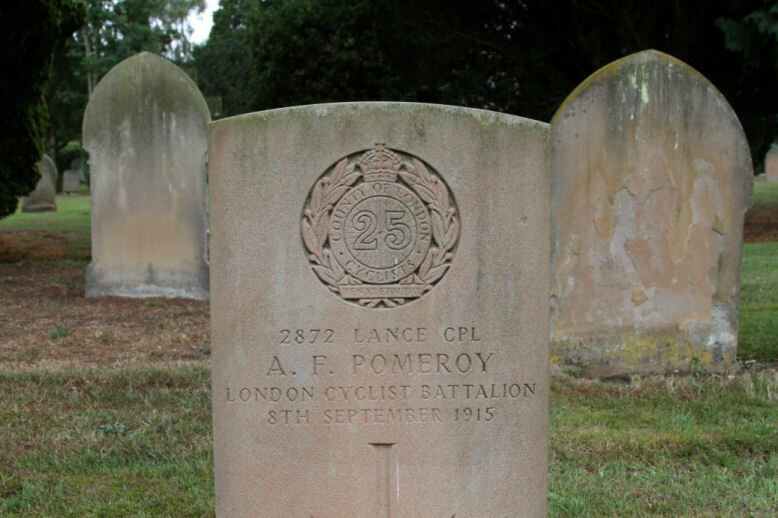 Alfred is one of three soldiers listed as dying in East Dereham, Norfolk on the September 8th 1915. The commander of a Zeppelin (L14 ) jetisoned its bombs over the town because of engine problems before returning for home. It was one of four Zeppelins, three which were directed against London and one against an ironworks at Skinningrove. as the 25th Regiment badge is on the CWGC grave stone below.